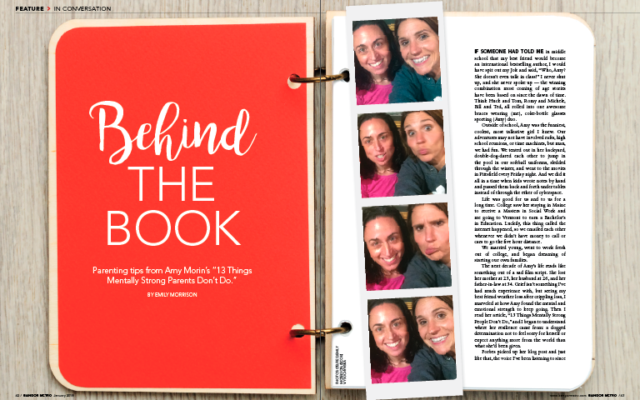 If someone had told me in middle school that my best friend would become an international bestselling author, I would have spit out my Jolt and said, “Who, Amy? She doesn’t even talk in class!” I never shut up, and she never spoke up — the winning combination most coming of age stories have been based on since the dawn of time. Think Huck and Tom, Romy and Michele, Bill and Ted, all rolled into one awesome braces wearing (me), coke-bottle glasses sporting (Amy) duo. Outside of school, Amy was the funniest, coolest, most talkative girl I knew. Our adventures may not have involved rafts, high school reunions, or time machines, but man, we had fun. We tented out in her backyard, double-dog-dared each other to jump in the pool in our softball uniforms, sledded through the winter, and went to the movies in Pittsfield every Friday night. And we did it all in a time when kids wrote notes by hand and passed them back and forth under tables instead of through the ether of cyberspace. To read this article in full, pick up the January issue of Bangor Metro available now! Click here for a full list of where to find Bangor Metro on newsstands or better yet – click here to subscribe and get Bangor Metro delivered to your door!